In Italy: Altedo Green Asparagus PGI, Vignola Cherry PGI, Romagna Peaches and Nectarines PGI, Lusia Salad Leaves PGI, Emilia Romagna Pear PGI, Treviso and Castelfranco Veneto Red Radicchio PGI and Chioggia Radicchio PGI. In France: Perigord Strawberry PGI, Sables des Landes Asparagus PGI, Adour Kiwi PGI, Grenoble Walnut PDO, Limousin Apple PDO, Perigord Walnut PDO and the Spanish Ribera del Xúquer Persimmon PDO. In Germany: the Spanish Ribera del Xúquer Persimmon PDO and Grenoble Walnut PDO. “Europe signs the products of its territories”: this is the message that will accompany the campaign over the course of the three-year period (2018 – 2019 – 2020), to reiterate the importance of the European labels that guarantee excellent and high-quality products for consumers. European products with PGI and PDO quality logos are closely linked to the area of origin and have well-defined and guaranteed characteristics. Flavour, seasonality, local character, production guarantee and controls are fundamental elements in the distinction of products with quality logos from conventional products. For the French part: APFELSO (French association of the growers’ organisations of the south west) including the following consortia Asperge des Sables des Landes IGP, Fraise du Périgord IGP, Kiwi de l’Adour IGP, Noix de Grenoble AOP, Noix du Périgord AOP and Pomme du Limousin AOP. For the Italian part: the following consortia: Consorzio della Pera dell’Emilia-Romagna (lead project organisation), Consorzio dell’Asparago d’Altedo IGP, Consorzio della Ciliegia di Vignola IGP, Consorzio della Pesca e la Nettarina di Romagna IGP, Consorzio dell’Insalata di Lusia IGP, Consorzio del Radicchio rosso di Treviso e Castelfranco Veneto IGP and Consorzio del Radicchio di Chioggia IGP. For the Spanish part: the consortium of the Kaki Ribera del Xúquer PDO. 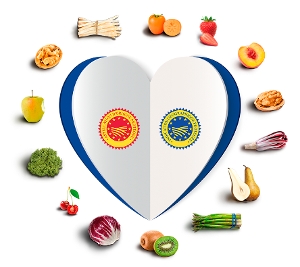 By means of promoting the regions of origin, the advertising campaign aims to inform consumers and industry professionals of PDO and PGI labelled products and of their many advantages.